Well, it’s 10:25pm and I should be getting ready to sleep, but I can’t without getting this email out!! Let me quickly tell you about something we did to make PBwiki easier for your coworkers and students. We just rolled out a new FrontPage for new wikis that makes it easier to get started. 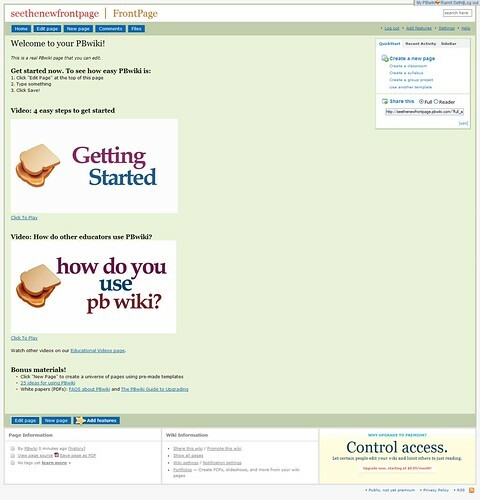 Now when you create a new wiki, you’ll see clearer text, help documents, and quick videos that give you a tour of how to use PBwiki. All this stuff is now on the FrontPage. Check it out by making a new wiki at http://www.pbworks.com. The new FrontPage is one of the ways we’re making it easier to get started using PBwiki. Please tell your friends!